This 6 in 1 heat press machine swing-away heat press boasts all of the must-have attachments includes flat platen, mugs press, plates press and cap press It can transfer colorful pictures and characters of sublimating and dissolved printing ink onto ceramics, glasses and textiles such as cotton, flax, chemical fiber, nylon, etc. 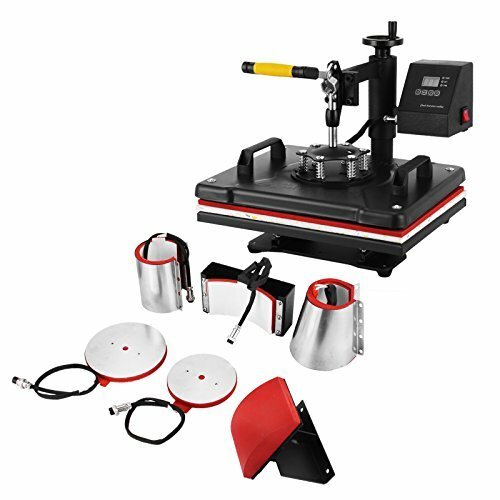 Platen Press (telfon-coated): 12" x 15"
This 6 in 1 heat press machine swing-away heat press boasts all of the must-have attachments includes flat platen, mugs press, plates press and cap press. Dear customer,if you need detailed instructions,please contact our customer service.Thank you !